In this 2 minute and 16 second segment from her interview on the Five Most Important Things She has Learned in Busienss and Life, Jill Konrath talks about how she redefines a problem by turning it into a challenge. This is number three of five extracted from her interview “The Most Important Things Jill Konrath has learned in business and life.” Hear the full interview here. Konrath’s sincerity comes through in this heartfelt advice. In one minute and 15 seconds Jill Konrath talks about a defining moment in her early sales career that put her on a life-time pursuit of serving the customer well. This is number three of five extracted from her interview “The Most Important Things Jill Konrath has learned in business and life.” Hear the full interview here. 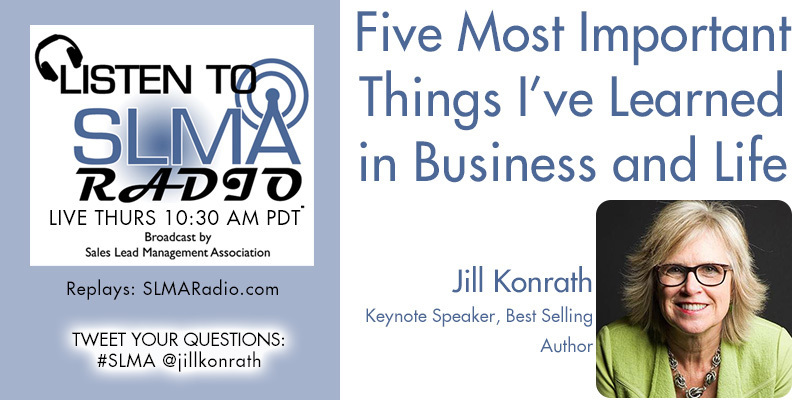 As part of our ongoing series of interviews on what executives have learned in life we spoke with Jill Konrath about the 5 Most Important Things she has Learned in Business and Life. Jill shares some personal stories from her early days in sales. She covers an early failure that nearly stopped her in the first few months of her sales career.